Disclaimer : I take no responsibility for harm done to individuals or components as a result of this installation or misuse of this information. If you have read over the following tutorial and are still uncomfortable completing this installation, CONTACT ME and I will help answer your questions or try to direct you to an experienced installer who can assist you. About this guide: The automotive environment is a very harsh one, in particular, most vehicle’s main +12V power supply isn’t really +12V. It can fluctuate significantly as the engine revs and other systems power draws fluctuate. This creates a challenge where some LEDs and the Ghozt Sequencers themselves can be damaged by excessive voltage. This guide will show you how to build a very simple regulator circuit that will maintain a steady supply voltage that will keep your LEDs and other components nice and safe. This booster will be able to supply up to 3 Amps at +12V to the Ghozt sequencer and any LEDs that you have connected. Users of the guide should be confident in their soldering skills. Users should be able to determine how much current their LEDs require. Users should be able to assemble a circuit to prevent post-installation failures. Users should know how to manage heat in their electronic builds to prevent overheating and/or vehicle fires. Users should have experience using the Ghozt Sequencers in simpler builds. 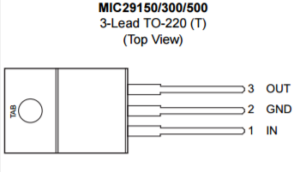 Users show be able to determine if a voltage regulator is needed for their LEDs. This guide is recommended for individuals who have experience building custom LED arrays for taillights. 1000 Ohm Resistor (x1), 1/4 watt. Step 2 – The circuit diagram: Below is a diagram of the circuit you will be building. Be aware that the capacitors will be polar, meaning they have a positive pin and a negative pin. Ensure that the negative pins go to the ground pin of the regulator. The regulator input should go to the vehicle’s +12V supply through a fuse box. You can connect up to 3 amps worth of loads to the output. If you use more than 1 amp, it is recommended that the heatsinc be used. Insulate metal connections wherever possible. In the event that anything does shift around, you don’t want it to cause a short. This can lead to fire, a blown circuit, or faulty operation. Be aware of how much heat will be produced in your assembly and make sure you know how to manage it. With this much power some of the components are going to get warm, including the regulator and the LEDs. Be aware of the overall amount of heat and any hot-spots. Make sure that there is room for air to circulate by convection so that all of the components get the cooling they need. Use zip ties and other wire management techniques to keep wires away from hot components that can melt insulation. Use only fire retardant materials. Consider potting this part of your assembly. This will help with all three of the above suggestions and can provide water-proofing, if needed. Use thicker gauge wire than normal. Normally, we recommend #22 or thicker stranded wire everywhere. When building a high-powered assembly, we recommend that you consider going even thicker on the +12 and Ground connections, as well as any internal connections that will carry alot of current. When done, inspect all of your connections and test carefully before installing. Enjoy!